Our chocolate truffles are created by a Swiss chocolatier who has been making chocolates for over one hundred years. They come in an assortment of flavors, fillings and sizes, and are beautifully presented in a keepsake pine box with dovetail corners finished with wired French ribbon. The small box holds one half pound of chocolate containing approximately thirty-seven pieces. The larger size is a full pound and contains sixty-four pieces. 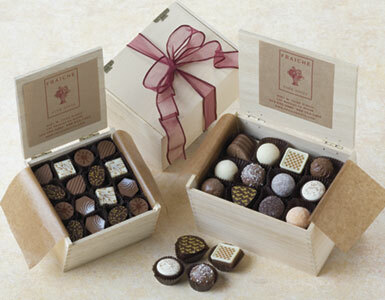 We have searched the globe for the finest truffles and believe you will agree once you have had a sample. We specialize in chocolate truffles, imported assorted truffles, chocolate truffle gifts, Swiss chocolate truffles, and offer box of truffles, and imported truffles boxed for any occasion. We promptly deliver your wooden box of truffles or box of chocolates to your home or office in Beverly Hills, West Hollywood, Santa Monica, and greater Los Angeles area.